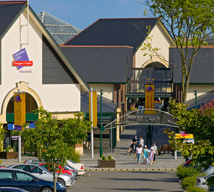 At East Midlands Designer Outlet there are 70 stores offering favourites like Gap, Levi’s, Ben Sherman, Calvin Klein Jeans, Superdry, LK Bennett, Kurt Geiger, Nike, Barbour and Marks & Spencer at discounts of up to 60%. Opened in October 1998, this is more a discount outlet for high street brands rather than high-end international designer labels. East Midlands Designer Outlet is situated in the heart of Nottinghamshire, a county known worldwide as the legendary home of Robin Hood. Here you can discover the historic houses, quiet market towns, old villages and rolling hills. East Midlands Designer Outlet is conveniently located just off Junction 28 of the M1 motorway, 30 minutes from Nottingham and Derby. There are 1,400 car parking spaces at this outlet. Trent Barton Bus Company operates the following daily services that stop at the East Midlands Designer Outlet. Mansfield Railway Station is approximately 15 minutes’ drive away. There are regular trains operated by Central Trains running directly between Nottingham and Mansfield. Derby train station is about 10 minutes’ drive away. National Rail Enquiries, Telephone +44 (0) 8457 48 49 50. For more Designer Discount Outlets in other cities in the UK and Europe, see our Designer Outlet Directory.